Vintage Style Oval Diamond Engagement Ring 0.88 tcw. This is a vintage style engagement ring setting for an oval diamond with 86 round diamonds 0.88 total carat weight, pave-set on three sides of the 14 karat white gold antique band and around the oval head. Also available in platinum, yellow and rose/pink gold. This ring accommodates a 7.5x5.5 Oval diamond. 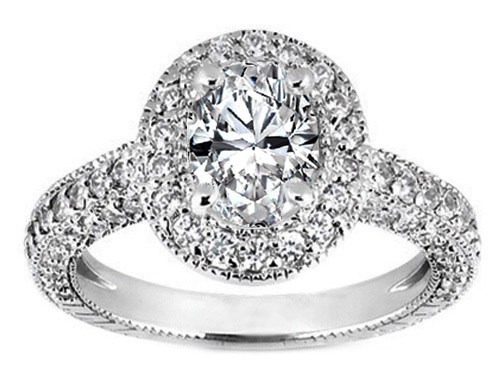 This is a vintage style cathedral engagement ring setting for an oval diamond with approx. 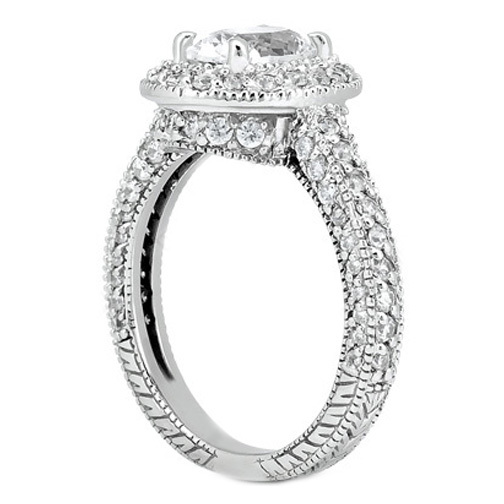 116 round diamonds, 1.1 total carat weight, pave-set on three sides of the 14 karat white gold antique band and a double row halo around the oval main diamond. Designed to fit the matching wend band flush next to the engagement ring under the head of the engagement ring. This ring is custom made for an Oval Diamond from 1/2 carat and up. Also available in platinum, yellow and rose/pink gold. This setting is made for a Oval Diamond 6x4mm (approx. 0.9 CT) and can be customized for other shape and sizes. Vintage Style Horizontal Oval Diamond Engagement Ring, Pave Set, White Gold, 0.88 tcw. 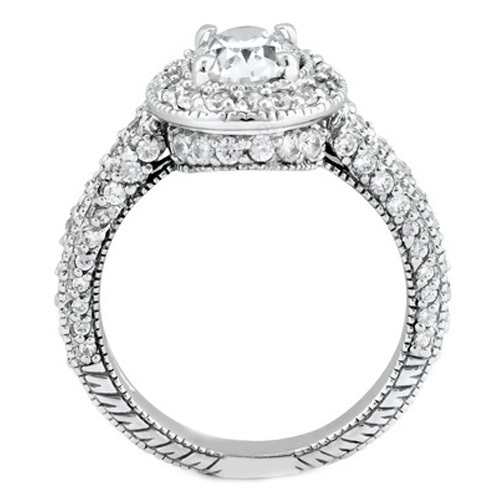 This is a vintage style engagement ring setting for a horizontally set oval diamond with approx. 86 round diamonds 0.88 total carat weight, pave-set on three sides of the 14 karat white gold antique band and around the oval head. Also available in platinum, yellow and rose/pink gold. 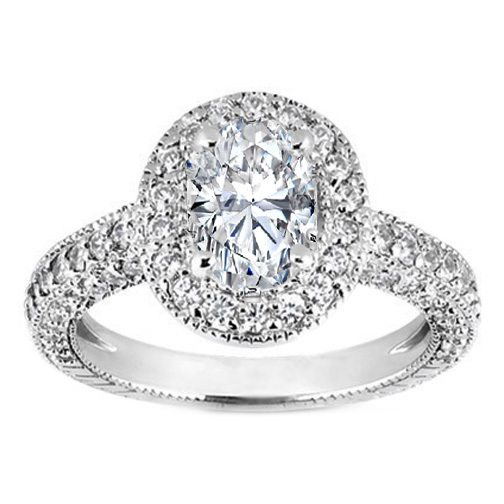 This ring is custom made for an Oval Diamond from 1/2 carat and up. Vintage Style Oval Diamond Engagement Ring Setting Pave Set, White Gold, 0.92 tcw. This is a vintage style engagement ring setting for an oval diamond with 88 round diamonds 0.92 total carat weight, pave-set on three sides of the 14 karat white gold antique band and around the oval head. Also available in platinum, yellow and rose/pink gold. This ring accommodates a 6.5x4.5 Oval diamond.